Okay, so it’s probably safe to assume that you’re here to get some good information on which car polisher and or car buffer to get. If that’s the case excellent, you are in the right place. If finding a good machine to polish your vehicles paint seems tedious, you aren’t alone. There’s hundreds of thousands of automotive detailers either getting started, or are already established and want to step it up to something that will bring excellent results. First off, lets dig into the two different types of paint polishers. These are by far the most popular types of machines used to polish vehicle paint. They are much more potent at removing deep scratches, and overall polishing the paint. The downside with them, is that they can remove paint from a vehicle VERY quickly if not used carefully. Using the variable speed control on a rotary car polisher, you’re able to buff more or less aggressively (depending on your needs). By far the safest option when it comes to car buffing. Dual action orbital polishers operate by oscillating numerous times per second in one direction. This enables you to safely cover every part of your vehicle’s paint, with little risk of doing damage to the paint. It wasn’t too long ago when this style of car buffing machine became a very popular thing, even children are capable of using these with no struggle at all. 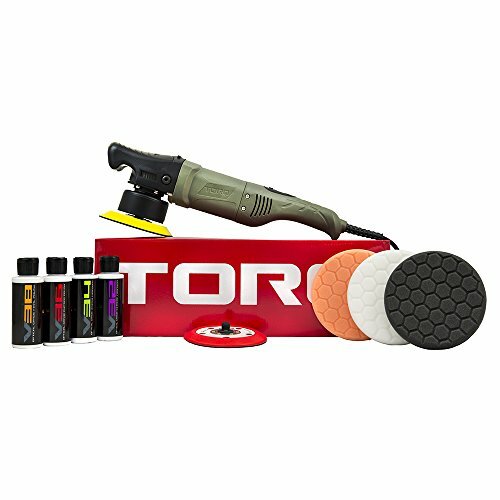 Coming in as our #9 contestant for the best car polishers to get, is the Torq BUF501X Random Orbital Polisher. This is a rather unique orbital polisher primarily because of some features. With approximately 20 inches in length (not including cord), 8.5 inches wide and tall, this random orbital buffer is designed specifically for automotive polishing. The front grip where you’ll place your left/right hand, is designed for more control of how much pressure and what direction you’d like to place it. The included backing plate is approximately 5″ inches wide, giving you medium sized pad to polish with. Right by the variable speed trigger, is a digital LCD screen indicating your selected setting. Overall weight isn’t too bad at just under 10 lbs and harmonious balancing enables you to handle the machine better. Identical to the Flex unit mentioned below, but for almost 50% less cost. For polishing and buffing ANY types of vehicle, consider looking into the Torq 10FX. When you think of Bosch, what comes to mind? 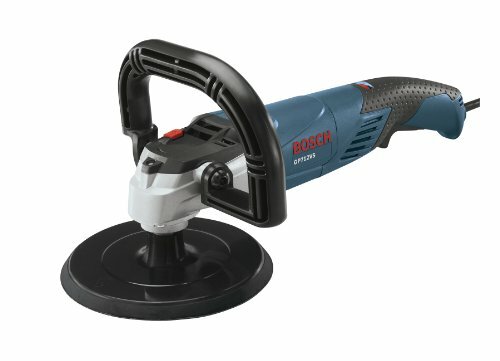 Drills, BIG power tools, tools in general, .. what about rotary polishers? Believe it or not, but Bosch makes a rotary polisher that is geared towards automotive detailers and enthusiasts. The Bosch GP712VS a a rather large angled polishing machine. Well put together for sure, it features a 7″ inch hook and look backing plate, along with a variable speed control for the 12 amp motor. Speeds range from 750 RPM to 3,000 RPM, it’s about 20% better than similar competitors. At only 19″ long, this rotary polisher weighs in at around 6 lbs, a MUCH lighter feel when comparing it to dual action orbital buffers like Torq (right above). With a one year warranty directly from Bosch, you have some piece of mind if some component is defective or breaks too easily. For beginner, intermediate, and professional detailers alike, Bosch GP712VS is a solid contender. Being a rotary makes it require a bit more skill compared to a dual action orbital buffers. Well-built polisher, is exactly what machine is. You may know Meguiar for their massive market share in the automotive care industry, and it’s to no surprise that they offer some heavy duty tools as well. Dual action orbital buffers are already more popular than they have ever been before, and Meguiar’s participation with their MG300 Pro Power DA polisher adds to that fact. Being an orbital buffer and polisher, you drastically reduce the risk of placing swirl marks, holograms, and other harmful effects to the paint. You’ll notice right off the bat it’s light weight feel of just 5.4 lbs, along with the ergonomic styling by the handle making it simple to maneuver. According to Meguair, the MT300 features Digital Torque Management (DMT) which provides necessary torque to maintain speed levels. With its simple “thumb adjustable” speed setting of 3,000 OPM to 7,500 OPM (Orbits Per Minute). It’s light weight, relatively short in length, much safer to polish paint with and user-friendly. 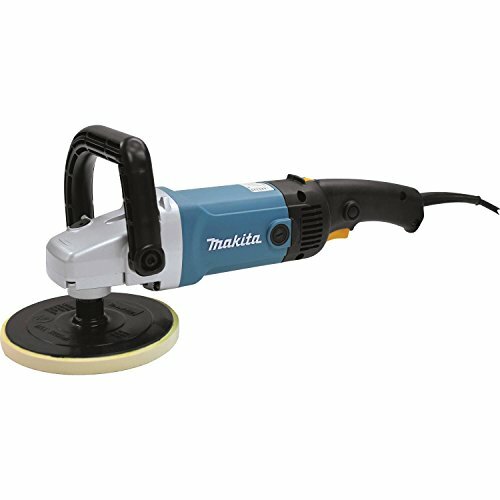 Undoubtedly one of the most popularly used rotary polishers in the detailing industry is the Makita 9227C 7″ inch Hook and Loop Polisher. 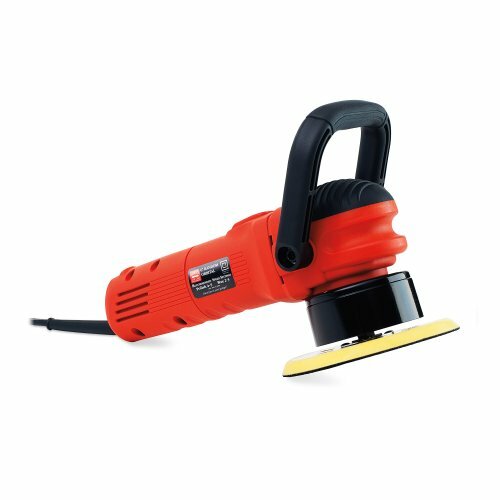 This is a multipurpose polisher that works quite well in the detailing industry as it does with industries like “body shops” when it comes to sanding. Being a rotary makes it very effective at getting TOUGH detailing jobs taken care of. It boasts a 7″ inch backing pad, along with an ambidextrous handle making it ideal for both left and right-handed individuals. The electronic speed control is right above the trigger, making it easy to reach with your thumb. Rotary speeds vary from as little as 600 RPM to as fast as 3,000 RPM, all coming from a 10 AMP motor. Length and weight comes in at around 18.5″ inches and 6.6 lbs (somewhat light weight). For beginners, intermediates and professionals alike, Makita’s 9227C rotary polisher will tackle long and tedious tasks without a problem. The only determining factor is your skill level, which takes just a little more time to master using a rotary. 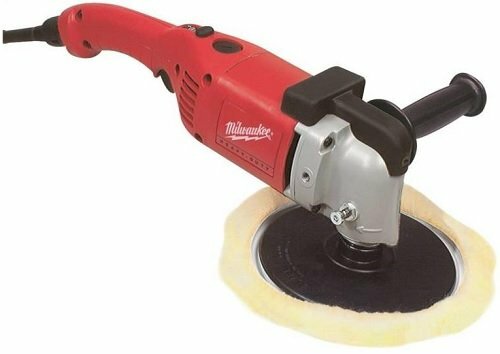 With more of an older styling, the Milwaukee 5460-6 7″ and 9″ Polisher takes our #4 spots for the top performing buffers and polishers. This one is relatively simple in design with a versatile 7″ inch and 9″ inch backing pad (allowing for greater coverage at once). With an 11 amp motor powering this machine, it’s capable of spinning from 0-1,750 RPM (using the variable-speed trigger). Whether you are left or right handed, an ambidextrous handle is available, making it suitable for most handling preferences. If you don’t want any fancy features but just straight-up durability and proper functionality, Milwaukee is the way to go. It’s priced at the professional level, and has excellent reviews averaging 4.7 stars from 5. Flex is the most premium brand in the car care industry, when it comes down to paint polishers. 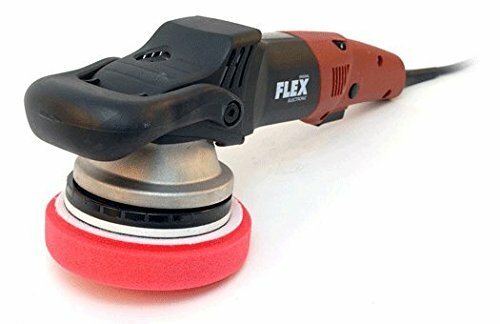 Flex XC3401VRG Rotary-Orbital Polisher is an ergonomic, paint polishing masterpiece. Definitely priced at a premium, this is what you resort to if you want the most expensive and highest quality dual action orbital paint polisher around. This machine boasts an 8mm orbital movement, capable of using 7″ inch buffing pads. It features permanent direct drive for an even polished surface and, a carbon brush wear down which automatically switches off the machine and protects it from damage (for how much it costs, this is crucial). The motor is not joke at 7.8 amps, capable of handling HEAVY use and loads. Speaking of handling, the ergonomic handle is ambidextrous, superbly comfortable, and easy to use to navigate the polisher. Lastly, the variable-speed control is located right above the trigger and is very easy to operate (reachable with your thumb). If you’re a professional detailers, this polishing machine is for you. The only drawback with this machine is its price, but then again, it’s pretty much like the Rolls Royce of orbital polishers. You’re paying for top notch quality, comfort and performance. Griot’s Garage car care products are in BIG demand in this day and age, priced at a slight premium over its competitors. 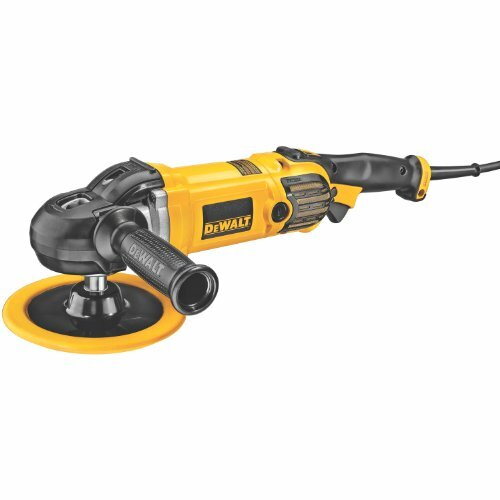 When we narrow it down to Griot’s 6″ random orbital polisher, you’ll see what it’s often chosen by many detailers. This is a slightly smaller buffer compared to some of the ones we mentioned above, at about 12″ inches long and just under 7 lbs in weight. We are impressed with the shape, making it easy to grasp with just one hand. The handle is ambidextrous, and the rubber coated pad by the handle makes it easier control where you are buffing. It’s quite good at removing swirl marks and scratches quickly, and safely. You can even use this to evenly apply wax to nearly every part of a vehicle. What some of the above buffers and polishers do, Griots Garage 6″ orbital polisher can do also. One of the best parts about this machine is the price of under 140 dollars, and even better are the average user feedback of 4.6 stars from 5. Beginner or professional, look into this! DeWalt is no joke when it comes down to rugged, quality built tools. Their wide range of power tools, along with regular tools are impressive. This is our #2 most recommended paint buffer and polisher you should consider getting. There’s a few reasons why this guide is SO so darn good, first off all it can fit both 7″ inch and 8″ inch sized backing plates. Powered by a 12 amp motor, it’s capable of driving speeds from 600 RPM to 3500 RPM, it’s ideal for applying a layer of wax thoroughly, and also to polish away the toughest scratches, holograms, and oxidation. Since wool usually flies around as its being used against the paint, it can often times cause problems for the motor. This DeWalt polisher offers “wool ingestion shields” to protect the wool material from entering inside the buffer (longer life+ reduced servicing costs are to gain). It’s a bit heavier (6.7 lbs) than the above-mentioned buffers and polishers, but the ambidextrous handle makes it easy to move around. Lastly, the biggest obvious sign that this rotary polisher works very well, is that over 300 individual user reviews have given it a 4.8 stars from 5! 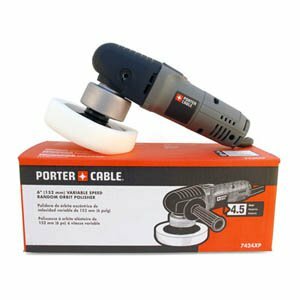 Porter-Cable is the most popular orbital polisher that is being used today, and that’s a fact. It’s small size and ease of use makes it perfect for beginners, intermediates, and even professionals. The 6″inch backing plate easily fits most foam pads, along with the heavy duty motor capable of producing 2,500-6,800 OPM (orbits per minute). It may seem very fast, but it’s incredibly safe for your paint and is quite hard to actually harm it using an orbital buffer. With the handle, it’s completely ambidextrous allowing you to move it from right side to left side whenever you like. A proprietary counter balance is used with the 6″ inch sanding/polishing pad to help with the even coverage. The switch for on/off is located at the top, slightly in reach with your fingers. Variable speed control is placed right behind your palm, making it tough to accidentally switch speeds. It’s priced perfectly, easy to use, powerful enough to cover every job you’d want, and it has a 3-year warranty from Porter-Cable. What more could you ask for? 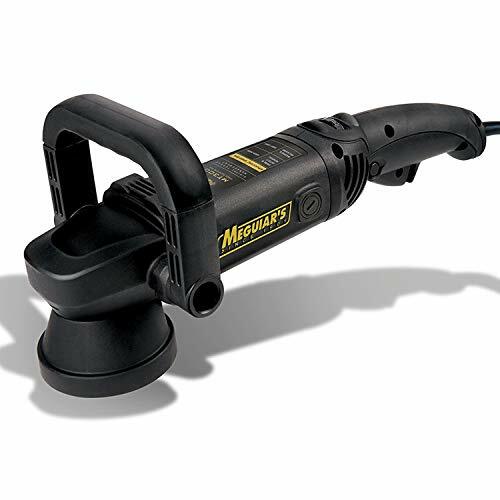 Over 500 individual user reviews, have given this variable-speed polisher a 4.7 stars from 5. NOTE: It’s extremely crucial to thoroughly wash your vehicle with some of today’s best car wash soaps (Meguairs, Chemical Guys, Mothers etc). To ensure you’re able to remove ant loose debris from your vehicle with ease, at a look at our pressure washer reviews. If you’re looking for cleaning products for the interior of your car, you might want to check out our article on the best leather cleaners and conditioners.